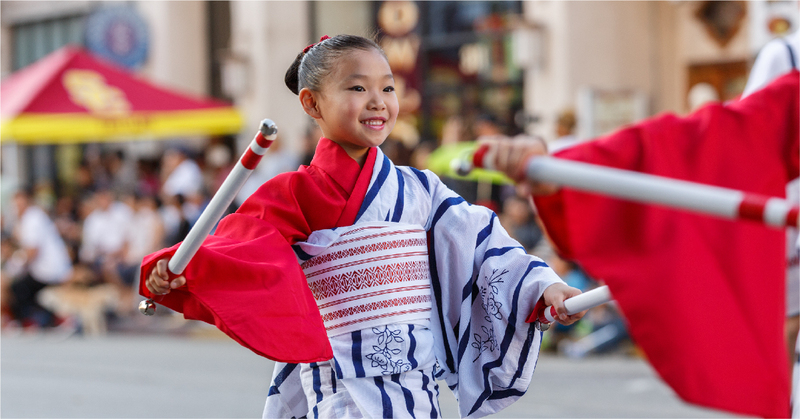 Enjoyed by thousands of people every summer, Nisei Week is one of the nation’s longest running cultural festivals of its kind. The 78th annual edition of this Japanese-American celebration takes place August 11–19 in downtown L.A.’s Little Tokyo neighborhood. This free festival showcases Japanese history and culture through events, family-friendly activities, exhibits, music, food and games. Ride the Metro Gold Line or Metro Bus 30/330 to Little Tokyo to attend the week-long festivities. Photo of Azuma Kotobuki Kai Dance Group, 2017. Nisei Week began in 1934 as a way to draw people to the neighborhood and patronize local businesses. Decades later, this summer tradition continues, telling a community’s story and celebrating its growing diversity. While the size and popularity of the festival has grown over the years, Nisei Week is still planned and organized by volunteers from the Japanese-American community. Nisei Week is free and open to the public — and there are many ways to enjoy. Things kick off with the Grand Parade on August 12. On August 18 a full day of events will be sure to please, including a Rubik’s Cube contest, a car show, and the Day-Lee Foods World Gyoza Eating Championship. The closing ceremony on August 19 features traditional dancing, clothing, and music. Be sure to also check out Tanabata Festival, which coincides with Nisei Week on August 11 and 12. In addition to public transit, you can also park and ride to Little Tokyo during Nisei Week. The free Nisei Week Festival Shuttle will operate from the SP+ Parking Lot located at 428 E. Temple Street on Sunday, August 12, from 3 to 9 p.m. All day parking is $6 and shuttle stops include 1) SP+ Parking Lot at 428 E. Temple St, 2) Judge John Aiso St and Temple St, 3) 2nd St and Los Angeles St, and 4) 3rd St and Alameda St.
For more Nisei Week information, visit www.NiseiWeek.org.